Between 1972 and 1974, the Mighty Macs of Immaculata College-a small Catholic women's school outside Philadelphia-made history by winning the first three women's national college basketball championships ever played. A true Cinderella team, this unlikely fifteenth-seeded squad triumphed against enormous odds and four powerhouse state teams to secure the championship title and capture the imaginati… ons of fans and sportswriters across the country. But while they were making a significant contribution to legitimizing women's sports in America, the Mighty Macs were also challenging the traditional roles and obligations that circumscribed their Catholic schoolgirl lives. 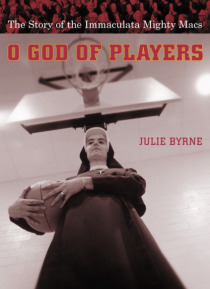 In this vivid account of Immaculata basketball, Julie Byrne goes beyond the fame to explore these young women's unusual lives, their rare opportunities and pleasures, their religious culture, and the broader ideas of womanhood they inspired and helped redefine.